Whee!! It's Friday! I can't wait for the weekend, I have so many errands I need to do and it's the first full weekend that I've had to myself in a long time. Do you have any exciting plans for this weekend? It's very rare that I wear a pink, and it's even more rare that I find a pink that knocks my socks off like this Nerdlacquer polish does. 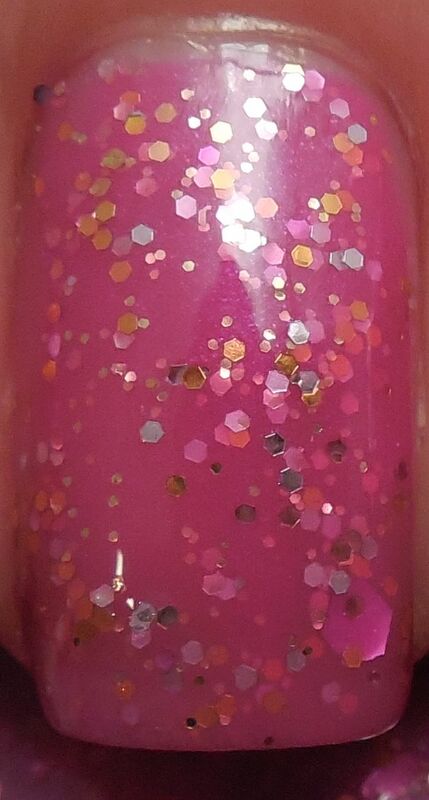 Resolutionary is a stunning warm pink crelly with silver and gold multi sized hex glitter. And when I mean stunning, I mean STUN-NING. I can't stop looking at it! I think I might actually have to get a back up of this. Gah! The formula was really nice and fairly opaque after two coats, with no clumping of glitter or dragging. NerdLacquer has really perfected the craft of a the perfect glitter polish! I used a layer of Poshe to hasten drying and add shine. I love how there are sparse large hex glitters that show up on a nail here and there, unlike the typical glitter bomb that overwhelms the nail. And I still can't believe that I'm loving a pink polish! Have you fallen in love with a pink polish lately, and if so, what was it?